These stingrays are found along the Atlantic coast of the United States from New Jersey down to the Gulf of Mexico and the coast of Brazil. They are common in the Caribbean. Rarely found at depths of more than 180 feet, southern stingrays prefer shallow water with a sandy or silty bottom. A stingray is a fish, even though its body resembles a flattened disc, with eyes on top and a mouth on the bottom. Its fins move like wings as it swims through the water. Some stingrays have very round discs, whereas the southern stingray’s flattened body looks more like a diamond from above. Southern stingrays “graze” along the sandy sea floor and try to stir up prey such as smaller fish, mollusks and crustaceans. They pin their prey beneath their body and use their strong jaws and rows of teeth to crunch through anything tough. Local fishermen occasionally catch and eat southern stingrays, but they are not fished for wide human consumption. One of the biggest threats faced by all stingrays is harvest for leather, which is increasing in popularity. Southern stingrays are still fairly common, but not enough is known about their numbers to declare them vulnerable. The zoo currently has two southern stingrays on display, one male and one female. More may be added in the future. Look closely at their tails and you can tell the male from the female—he has a clasper on either side of his tail. The rays are offered food on the same days as the sharks in the exhibit. Shark and ray feeding is viewable to the public on Monday, Wednesday, and Saturday at 11:30 AM. The rays can eat any food that may hit the bottom of the tank any time the fish are fed, but generally they rise to the surface near the shark feeding platform to take food offered by the aquarists on a feeding stick. As the rays rise from the bottom of the viewing window you can see the color of their undersides and the location of their mouths. If they are resting on the substrate, you may occasionally see them flap their fins to cover themselves with sand. In the wild they use behavior this to find buried food like clams and mussels. Like their relatives the sharks, sting rays have special organs called ampullae of Lorenzini that help them sense electrical fields. This ability helps them locate prey that is buried beneath the sand. Southern stingrays are known to visit ‘cleaning stations,’ where fish known as cleaner wrasse will remove the parasites from their bodies. A stingray’s gills are on the underside of its body near its mouth. Holes near the eyes, called spiracles, draw water in, which is then expelled through the gills. A stingray can bury itself to hide in the sand, leaving only its spiracles and eyes poking out. Stingrays are named for the venomous barbs on their tails, used for defense. Male stingrays are easy to differentiate from females as they have a clasper on either side of the tail base, used when mating. Not enough research has been done to assess the population of southern stingrays, although they appear to be fairly common. 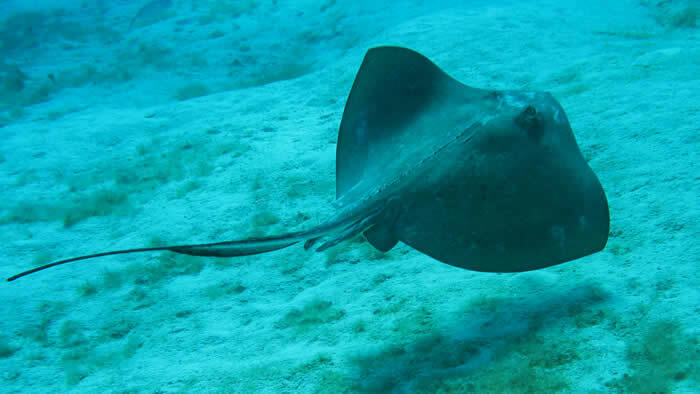 Many other species of stingray are endangered, however, and the southern stingray could follow if demand for stingray leather remains high. Stingrays are also caught as bycatch, meaning they are netted or hooked unintentionally by fisherman. You can learn more about sustainable fisheries that reduce bycatch by visiting the Minnesota Zoo’s Fish Smart page.